Phil Holden-Rushworth with his three children, from left: Freja, Bradley and Lainee. 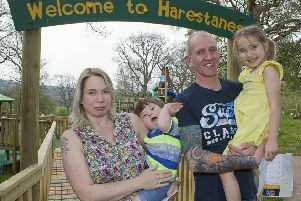 A father-of-three from Hawick is hitting the highway as a gesture of thanks to a town school which has helped put his children’s education back on track. Phil Holden-Rushworth is taking part in a 40-mile sponsored hike from Moffat to Hawick, along the Romans’ and Reivers’ historical route, on Saturday, April 13, to raise money for Stirches primary. The effort is a way of thanking headteacher Andy Jones and his staff for the education they are providing his children – Lainee, six, Bradley, nine, and Freja, 11. Phil, pictured with his children, had removed them from a previous school over dissatisfaction at standards there. He said: “I have got three young children who go to Stirches primary school. It’s one of the smaller community schools, possibly the smallest in the town, and the background is that my children had gone to another school and it didn’t go particularly well because of some problems there, but Stirches has been fantastic. Phil is hoping to raise £500 through his fundraising effort, but said any amount would be welcomed. He added: “It’s coming up to that time of year with the Reivers, with the history of the area, and I thought it might be a good thing to tie in with the common riding theme. “I was looking for a route with some kind of significance and I found there’s a Romans’ and Reivers’ route which runs from Moffat to Hawick and finishes at Stirches. z To find out more about Phil’s fundraising efforts, go to Facebook: SPSFundraiser2019; Twitter: SPSFundraiser and Instagram: SPSFundraiser.